The faithful of the Orthodox Church await with great joy and nostalgia every year the solemn Triodion. 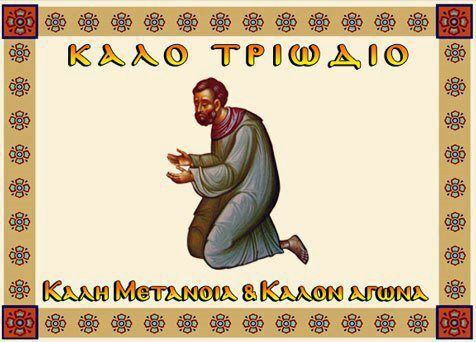 Fasting, temperance, repentance and spiritual joyful-sorrow are the experiences of the Orthodox, who are refreshed and renewed by the liturgical cycle of the feasts of the Triodion. We sense the roots of our tradition nourishing us and irrigating us with devoutness and holiness, much more so in the period of the Triodion. Whoever studies carefully the Triodion, will see with how much wisdom is its whole harmonious architecture from the Holy Fathers. One cannot find perhaps a better path for the Orthodox Christian to arrive at Pascha than from the Triodion - not just as a passenger through time, but like a pious pilgrim of the Passion and Resurrection. And this is why: its constitution is dictated by the general principal, that the Triodion is a ladder for the believer, on which the last step brings us to the bright atmosphere of the luminous Resurrection of the Lord. The period of the Triodion invites all of us, to leave behind our slothful and sinful lives and fight the good fight of temperance as shown by our Church, with fasting and prayer, which cleanse our souls and present us before Christ. And let no one say, that without this fight and without these virtues we can be cleansed and attain to the most-holy Christ. The holy and rich experience of so many saints of the Orthodox Church shows us the path, the only unerring path, that we must follow, with the physical and spiritual purification of our passions, that we may humbly arrive at the glory of the Bridegroom. And indeed within the Triodion, we see the sinful Publican groaning within himself, beating his chest in repentance. We see the venerable Mary the Egyptian becoming sanctified after living a most-sinful life. We see the harlot of the Gospel having a sound mind. We see the thief next to Christ theologizing. We also hear the solemn hymns of the holy and inspired hymnographers. The faithful Christian is pricked at heart, decisions are changed for the best, the path is taken for the confessional, where they leave behind the shame that burdened their souls until now, and afterwards they "drink from the source of immortality" - the "cup that cheers me like the best wine" - the Body and Blood of our Lord and God and Savior Christ. This is the Pascha which is the destination for the faithful in the Triodion. "Shining with fasting of the soul, let us become white as snow, and as pure brides of Christ, let us participate in the secret Pascha and the bright and divine Resurrection." Source: From the book Eros Orthodoxy. Translated by John Sanidopoulos.